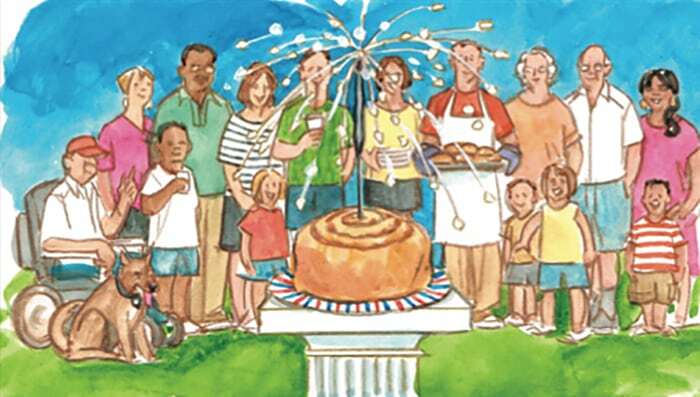 A few years ago on the Fourth of July we wanted to invite some neighbors over for homemade cinnamon rolls. I make the rolls from scratch; my wife invites. We live in the middle of the block. While the majority of the folks are of European heritage, the diversity gets better each year. On one side, next door, lives an older couple. They have lived there for about fifty years and their children and grandchildren come frequently; the lawn and gardens are exquisite. Warm three cups water, 1⁄2 cup honey, and 2 tablespoons of oil. Next to them is a couple whose children have moved out, mostly, except when they come back. Then there is a rented house with a very nice couple living there. Mix with 4 teaspoons of yeast (that’s two packages) and almost eight cups of flour; use a mixture of whole wheat, pastry, and unbleached white flour. Then comes another older couple; for them it’s one of those “he grew up a few blocks north of here and she grew up a few blocks south.” They have lived here forever, know everyone, and will help in any way possible. As the mix becomes more solid, turn out onto the counter and begin kneading. In the next house is a woman from Peru, her mother, her young son who was born in Hopkins; and her boyfriend who hails from Mexico. Add flour until the dough is no longer sticky. As we move down the block there is a man from Hawaii and his family. Continue kneading for about 10 minutes. There are two more families before the corner. I don’t know them well; they live kind of far away. Behind the corner house lives a French-speaking woman and her family. On the other side lives the veteran who uses a wheelchair; he lives with his German shepherd and two cats. Let rise until doubled. Next to the veteran lives a young couple with two young children; the father of the family bought the house from his parents a few years ago. They, too, know everyone and share their strength and snow blower. Punch down and divide in half. Next to them lives another family whose kids are a bit older; he is African American and she is European American; a friendly, energetic, welcoming family. Roll the first half into a rectangle about 12 inches by 18 inches. Next to them lives a family from Ethiopia; easy to talk to they are. Spread a stick of softened butter and a mixture of 1⁄2 cup white sugar, 1⁄2 cup brown sugar and 1 tablespoon cinnamon. Then comes a family with two young children, and on the corner lives a woman from Vietnam and her European American husband and their two children. Roll up starting on the long side; cut into 12 rolls. Do this to each half of the dough. Asia, Africa, Europe, Latin America, and North America all rolled together on my block in Saint Paul, Minnesota. Let rise again and then bake the rolls at 350 degrees for 25 minutes. They’re perfect! Let’s see who can come celebrate the Fourth.